Utilizing simulations, the efficiency of the newly developed PROGREENcity technologies regarding their micro-climatic effects (cooling effect, insulation effect, climate improvements) and their ability to absorb particulate matter are publicly traceable online. The actual gauging stations in the form of inhabited, greened Microhouses are situated in 3 European cities, representing different climate zones: Vienna (Austria), Bottrop (Germany) and Madrid (Spain). The measurement results of the houses can be observed under www.progreencity.com. The measurement results as well as the evaluation of the experience accounts of the tenants provide an extensive data set, which builds the basis of a focused planning strategy for the effective processing of urban environmental problems under site-specific circumstances. 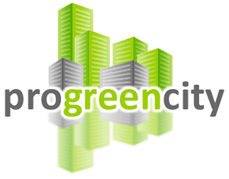 The accumulated data are aimed to convince politicians, architects and planners, municipalities and the public of the need for green constitution of future cities, with PROGREENcity providing the means.